Tucked away in a quiet peaceful neighborhood located Whitney Ranch, this home has it all!! BRAND NEW never been lived in JMC Home! Very energy efficient home with solar so you will have a large savings on your monthly power bills! This home has a very nice open floor plan, the spacious kitchen has a large island/breakfast bar, plenty of storage space and stainless steel appliances. The elegant kitchen/nook area opens up to the large family room area that has a sliding glass door that leads out to the backyard. The backyard has a covered concrete patio perfect size for a outdoor table set with chairs and a BBQ, perfect for entertaining family and friends. Lots of newly planted shrubs and plants and a storage shed. Upstairs there are 3 additional bedrooms a spacious laundry room and 2 large bathrooms which includes the large master bedroom/bathroom. 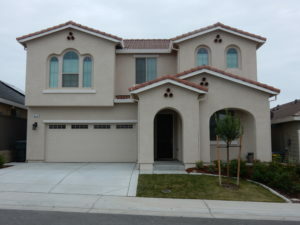 Living in Whitney Ranch you are living in the middle of a amazing community of the area’s best schools as part of Rocklin Unified School District, you are across the street from Whitney Ranch High School, Granite Oaks Middle School & Sunset Ranch Elementary School, all fantastic schools. You are surrounded by great local parks, biking trails and close to shopping and dinning.